Media captionDet Ch Insp Pete Montgomery talked about the footage on the BBC's Crimewatch programme on Thursday. Police believe the gunman who killed a west Belfast man outside a school in December was at the scene five days previously, waiting for him. They have also attributed the murder of Jim Donegan, 43, to the INLA, a republican paramilitary group. The latest CCTV images of the alleged gunman were broadcast on the BBC's Crimewatch programme on Thursday. 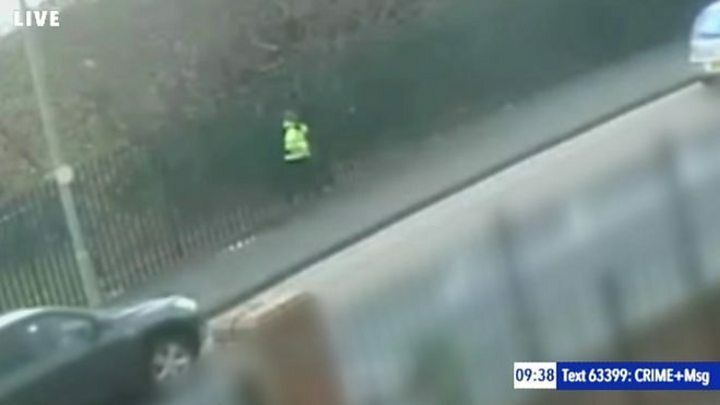 They show the suspected killer standing among school children outside St Mary's Grammar school on 29 November. Analysis: Who are the INLA? The Irish National Liberation Army (INLA) is believed to have been behind 120 murders during the Troubles in Northern Ireland. In 1979, it used a car bomb to murder Tory MP Airey Neave at the House of Commons. Post-ceasefire in 1998, it has morphed into an organised criminal gang, whose activities include extortion and prostitution. A government report four years ago said it operated largely "for the personal gain of its membership". It is one of the groups targeted by the Paramilitary Crime Task Force, led by the PSNI, established in late 2017. Last April, the task force mounted a major arrest operation against the INLA in greater Belfast. It continues to have access to some weapons. Read more: Who are the INLA? Speaking on Crimewatch, PSNI Det Ch Insp Pete Montgomery said: "This is CCTV footage from 29 November and I believe this is the same person who murdered Jim. "He waits for 20 minutes amongst the schoolchildren, waiting for Jim to arrive to pick up his son. I believe if Jim had arrived there to pick up his son that day, he would have been murdered [that day]." In December, the PSNI released CCTV footage of the gunman "mixing with pupils" seconds before Mr Donegan was shot, as well as images of him fleeing the scene in the direction of Clonelly Avenue - the same place he emerged from before the shooting. On Thursday, Det Ch Insp Montgomery said: "I'm particularly keen to speak to anyone who was in the area at the time of the murder. "Did they see the gunman going in to Clonelly Avenue? Did he go into a house? Did he go into a waiting car? Where did he go?" Last month, police released an image of what the suspected gunman may look like. This image was broadcast again on Thursday's programme. The Police Ombudsman's Office has begun an investigation into how the PSNI dealt with information about a potential threat to Mr Donegan received before his murder. The ombudsman is investigating whether the information was properly processed.